Bakersfield College shortstop Kamron Willman missed all of the 2018 season with valley fever. After sitting out the season, Willman returned a better player. BC shortstop Kamron Willman applies a tag on LA Pierce's Zach Kaminkow during a game last week at Bakersfield College. Bakersfield College shortstop Kamron Willman tries to get back to second base to apply a tag on LA Pierce's Nolan Bodeau during a game last week. 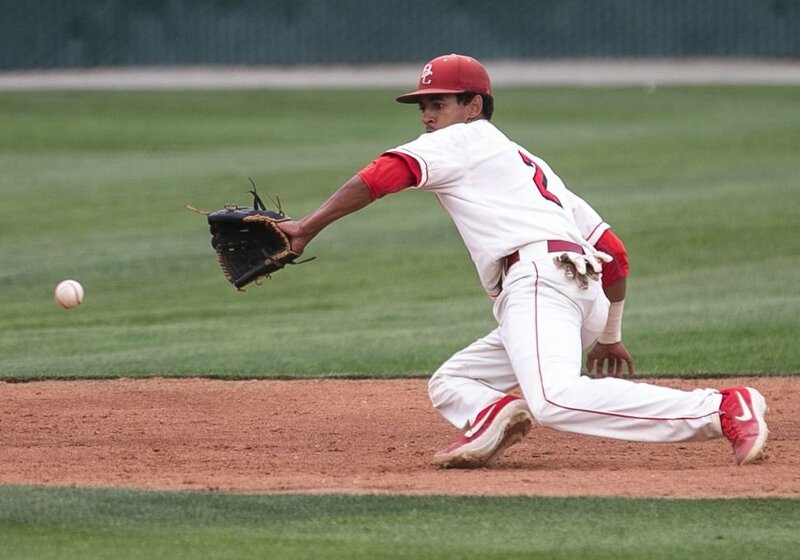 Bakersfield College sophomore shortstop Kamron Willman missed the entire 2018 season with valley fever. Willman spent the rest of the morning throwing up. On two hours of sleep, he ran Bakersfield College baseball’s six-minute mile test. He passed in about 5:45, but it was one of Willman’s worst days with a severe illness. Willman was diagnosed with valley fever, an insidious respiratory disease endemic to Kern County, about a week before the start of the season in January 2018. He thought he’d miss a few weeks and get a late start to the year, but the fungal infection knocked Willman, a Ridgeview graduate, out for the entire season. The symptoms started in late December with pain in Willman’s respiratory system. He thought it was a cramp from not drinking enough water. But it kept coming back so he went to the doctor. When BC reconvened in January, both Willman and Painton came back with diagnoses of pneumonia. They even compared medication they were prescribed. Willman had his blood drawn for tests. Learning he had valley fever was “shocking,” he said. Willman had a close friend’s mother die from valley fever. Caused when airborne Coccidioidal fungal spores are inhaled, valley fever infected 2,929 people in Kern County in 2017 and killed nine of them. Doctors told Willman he likely had it for about two or three months without knowing. Willman was prescribed Diflucan, an antifungal drug, for about four or five months. He lost 30 pounds, dropping to 140. The hardest part, Willman said, was not playing baseball. He watched the entire season, still making it to practices and virtually every game. Making things worse, Willman missed what could have been his final year playing with his twin brother Kyle. The two played on the same baseball teams since they were about 5 or 6. Kyle Willman moved on to Division I Campbell in North Carolina, where he is redshirting after getting into a car accident, Willman said. “Not being able to play with him kind of stuck with me a lot, kind of hit me hard, too,” Willman said. Instead of hitting or taking grounders in the infield, Willman took mental repetitions. He watched how pitchers approached certain batters. He took note of how each one of his teammates approached their actual repetitions in games and practice. Willman returned in the summer as a different player. It’s part of his improved offensive performance and leadership in the infield, and why he was able to commit to Kansas State for next season.